From the striking reverse panels to the simple, clean lines, the Amish Mission Style Reverse Panel Bed is reminiscent of the Arts and Crafts Furniture Movement. 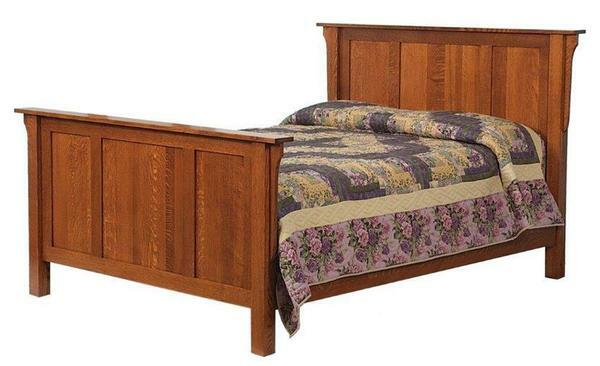 This bed is crafted using hand-selected hardwood, by skilled Amish woodworkers. Built to perfection, this Mission Style Bed will offer an heirloom quality piece that can be handed down for generations! Choose the hardwood and finish, add an option footboard drawer and you're sure to end up with a bed that will fit seamlessly into your decor! Call one of our Amish Furniture Specialists today to answer your questions or to start your order over the phone. Toll Free (866) 272-6773.